Tasmanian tradies need to look after the most valuable part of their toolkit – their health! This August during Tradies National Health Month Tasnanian physiotherapists are calling on tradies to take care of their most valuable asset – their health. It comes as Aussie tradies continue to have some of the poorest health and injury outcomes compared to other workers. According to the latest Safe Work Australia statistics*, our tradies make up less than one third (30 per cent) of the Australian workforce yet account for almost three in five (58 per cent) serious workplace injuries. 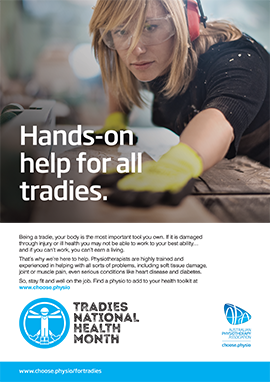 The Australian Physiotherapy Association (APA) campaign aims to engage and empower tradies to maintain their health and wellbeing, and seek preventive treatment before small ‘niggles’ become more serious chronic injuries. Most tradies assume a few aches and pains are part and parcel of their demanding physical work, but few seek regular preventive health checks which can significantly reduce common musculoskeletal conditions, including muscle/tendon injuries, knee, shoulder and back pain. Your Health Hub – APA physiotherapist Rebekah Wilcher says it is important to remind tradies that their health and safety is a priority, and that their bodies are their most important tool. This August when you book a new assessment with our Physiotherapy Team and Mention Tradies Health Month you will receive a free spikey massage ball to keep your body feeling good at home! This offer is limited to the month of August only so book now on 6122 0150 and start taking steps to look after your best asset!